In the morning, I realise that only rooms with attached bathroom have hot water supply. The manager looks at me lazily when I ask him for some hot water. He says that there is no hot water. I ask him so what should I do? I need at least a bucket of hot water. He then, still lazily, agrees to heat up a bucket of water on gas stove. I am convinced. At 6:30 AM, Tadashi and I set off on our scooters. 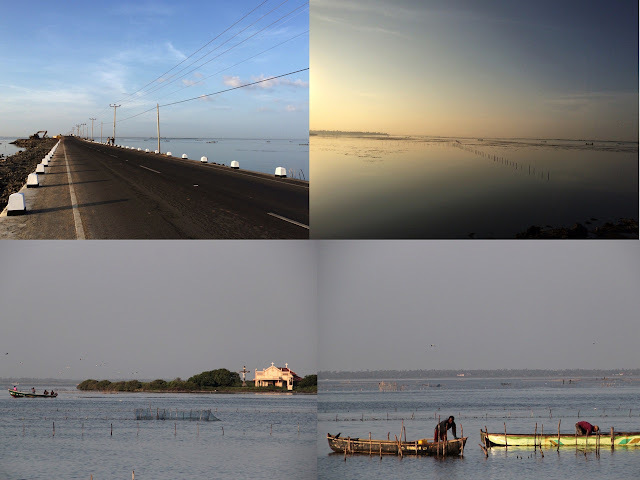 The long stretch of road from Jaffna fort towards the tip of the island is just beautiful. Along the road we spotted locals jogging and some taking a leisure morning walk. The fishermen have already begun their work. We are surprised by a group of Flamingos. 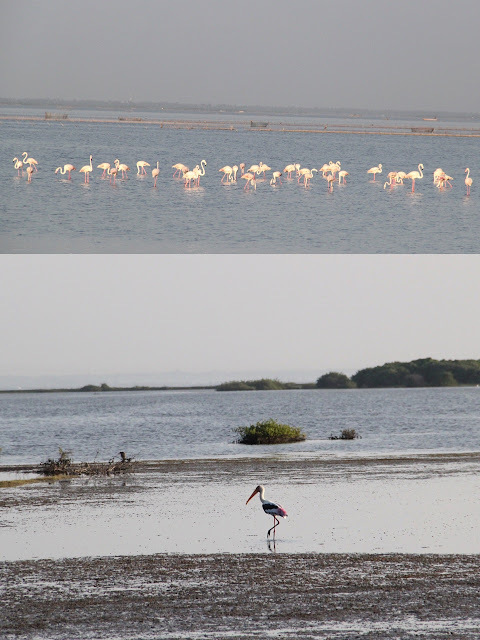 There are other birds like painted storks, herons and egrets as well all through this stretch. 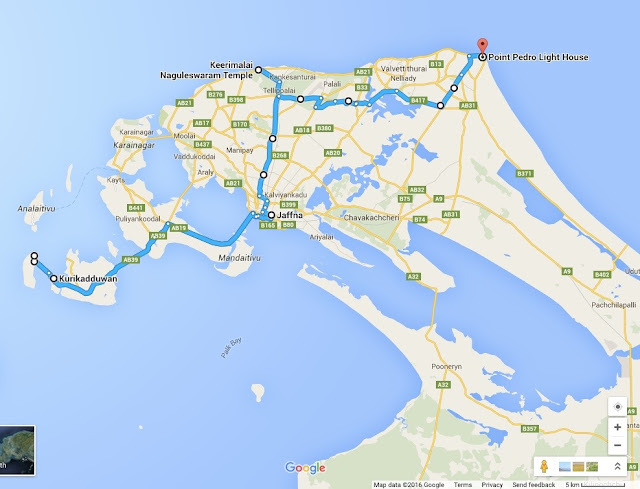 This 37 km ride from Jaffna city to Kurikadduwana was one of the most scenic rides I have had in Sri Lanka thus far. Most of the land here appear undisturbed. 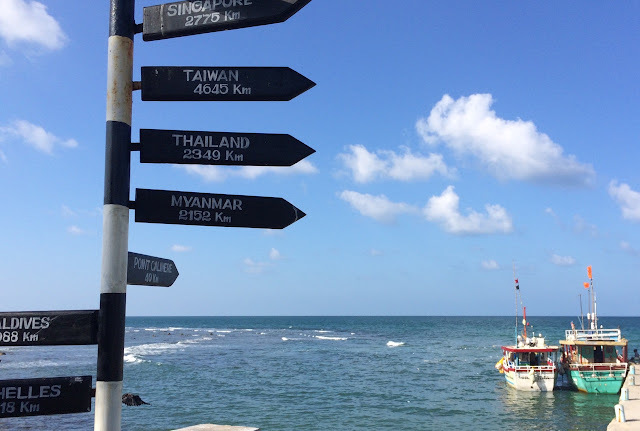 From here, one takes a ferry to cross the sea and reach the island called Nainathivu in Tamil and Nagadeepa in Sinhalese. It is believed to have been inhabited by Naga people. There are frequent ferries to the island and everyone must wear life jackets. I am totally impressed with Sri Lankans about following rules. Following this discipline is the way to move forward. In the island are two holy shrines - One of the Buddhists and other of the Hindus. Both are connected by a road with shops selling shells and other artefacts by its side. 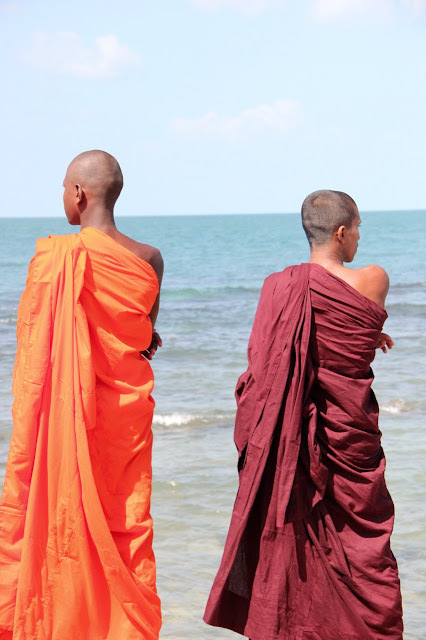 According to the Buddhists, Buddha visited this island five years after his enlightenment and brought his preachings to the Naga people. It now houses as Nagadeepa Purana Viharaya. At the Buddhist temple, Tadashi is requested to pay an entry fee. They assume me to be a Sri Lankan. Tadashi is not happy on this frequent demand of money in every Buddhist temple. 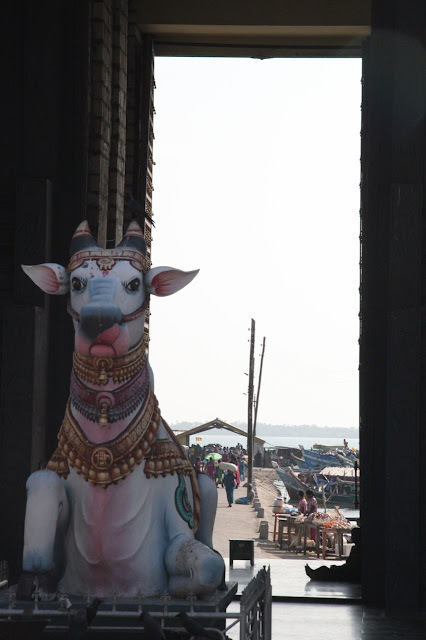 I take a glance at the temple without stepping inside and it looks fairly new with renovations and attached museums, so return back as well. We take the road connecting the Buddhist temple to the Hindu temple. Thankfully here we enter without an entry ticket. 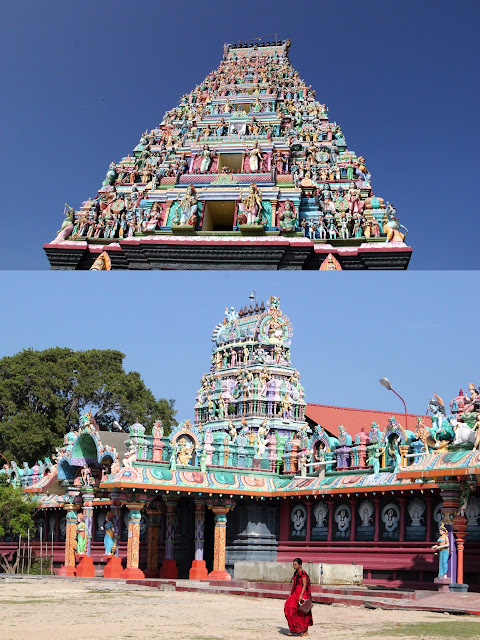 The Hindu temple called Nagapooshani Amman temple is dedicated to goddess Parvathi who is known as Nagapooshani. 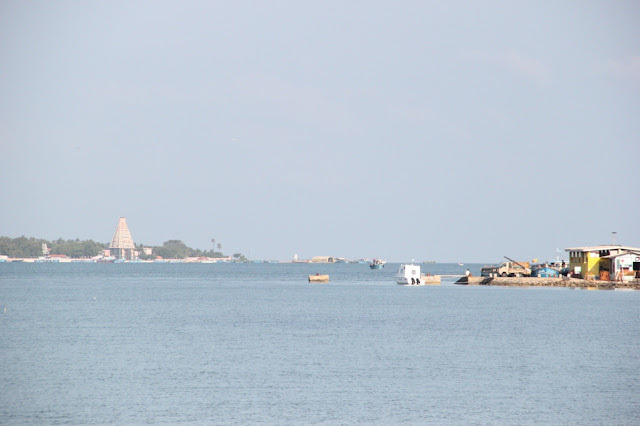 It is one of the Shakti Peetham. However, the original temple was damaged, looted and destroyed during Portuguese invasions like many other cases in the country either by the Portuguese, Dutch or the British. From here we return by another ferry. There is no proper system to control the ticketing in this ferry yet everyone makes sure to pay the ferry driver standing outside after landing. 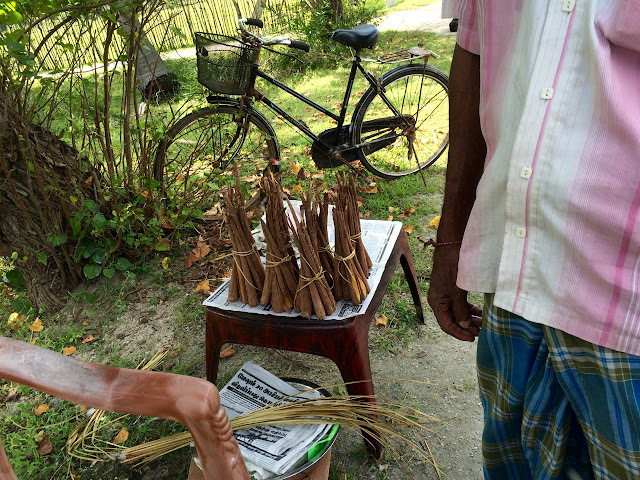 On my ride back to Jaffna, I stop by this old man who is selling something different. I learn from him that it is palmyra sprouts. He allows me to taste one and refuses to take any money in return. I am touched by his kindness and thank him before leaving. You get to meet these kind people only in the villages of India these days and that makes me wonder in what direction our cities are progressing. We are trusting people less and less, we are becoming more arrogant, greedy and selfish day by day. This thought makes me extremely sad but also is a learning to conduct myself in a certain way. We stop at a commercial bank in a small village on our way, to exchange some money for Tadashi. 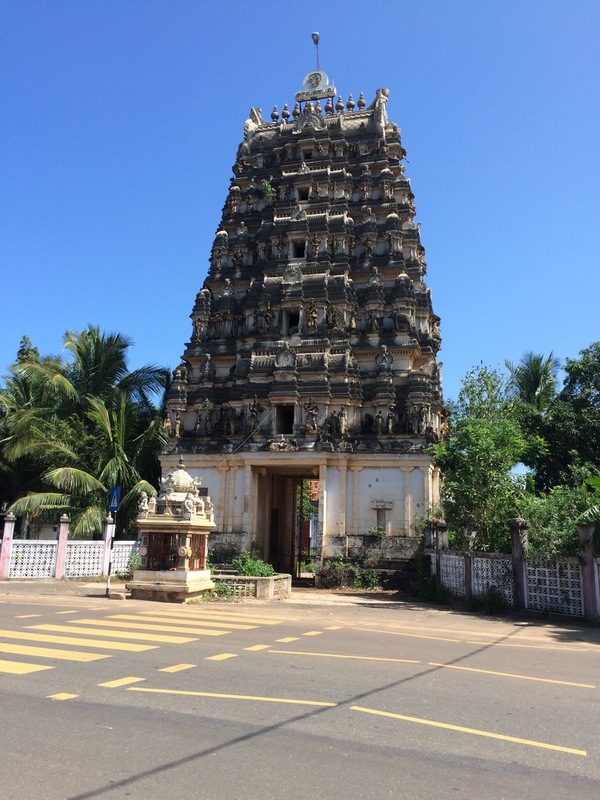 At Jaffna we stop at a restaurant in a busy street at the town center and have Masala dosa. The dosas are prepared and stored thus making it inedible. But again, I cannot expect Indian food to taste better elsewhere. The tea is extremely sweet as in every part of this country. I learn that the best way to go is to order Ceylon black tea that cannot go wrong. 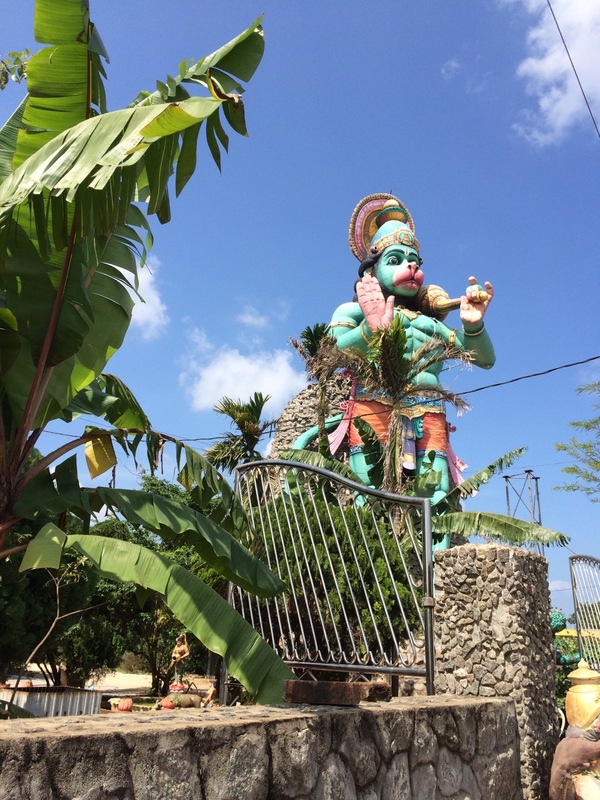 I am happy to see a Hanuman statue and temple finally in Sri Lanka. Hanuman plays a crucial role in reuniting Sita with lord Rama per the epic story of Ramayana. We also take a deviation at Chunnakam to reach a historic site called Kantarodai ruins filled with several small stupas. This is a controversial site. 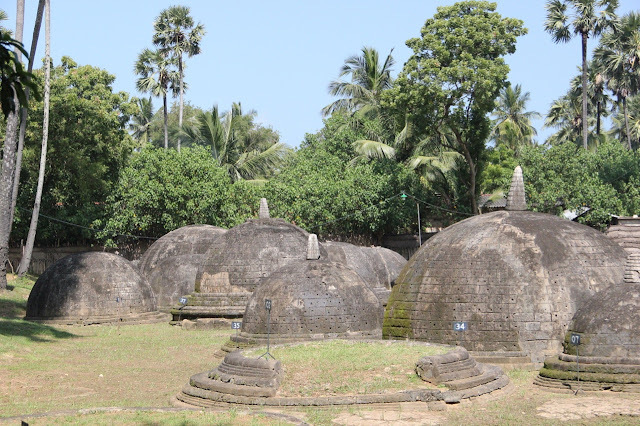 Originally flat-topped and low to ground, the stone structures were built upon by Sri Lanka’s department of archeology in 1978 - Some say to restore the orignal dagoba shape that the ancient Buddhist community here has created and others think of it as a statergic move to impose a Buddhist history on an ancient culture that may have been a burial site or of other traditional significance. "Who was here first?" seems like an important question to the Sri Lankans rather than their present. This is not something unseen of in other countries. Every country has its own similar arguments and fights. 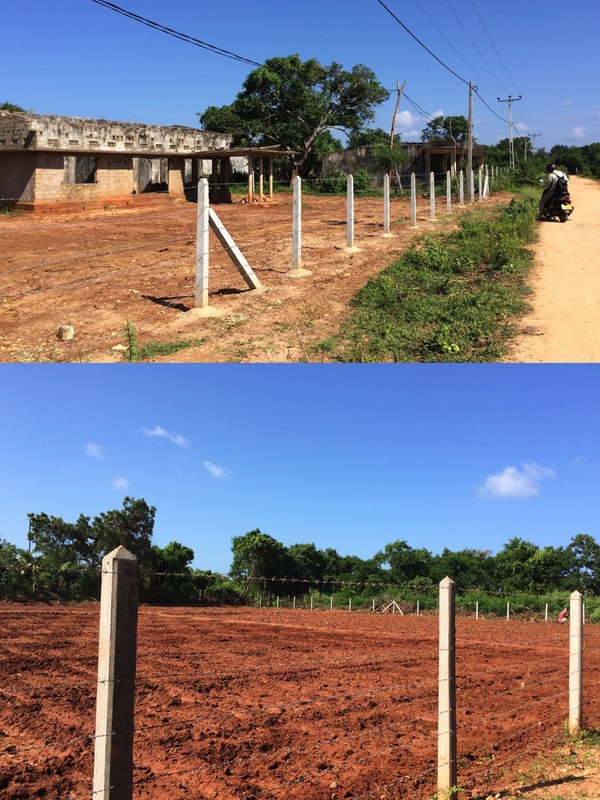 But what is more shocking is that this site is fenced and is guarded by two Sri Lankan army men. I realise the tension in this area but as I have always argued, the past must be an experience to learn from but should not be the major decision maker for our present and future. On our way to Keerimalai spring, we accidentally miss the deviation and ride directly into the controversial army camp of Palali KKS that also houses an airport. A few guards and army men smilingly approach us and ask us where we intend to go. They direct us to the right way and we make a U-turn. More than 25,000 families are believed to have been evicted out to form this base camp between 1983 and 1993 which now sits on a prime agricultural land. Everything around this region was either destroyed or converted for military use. At the point where you take deviation to Keerimalai spring is Maviddapuram Kanthaswamy Kovil that has survived bombing during the war. It is now flourishing again. 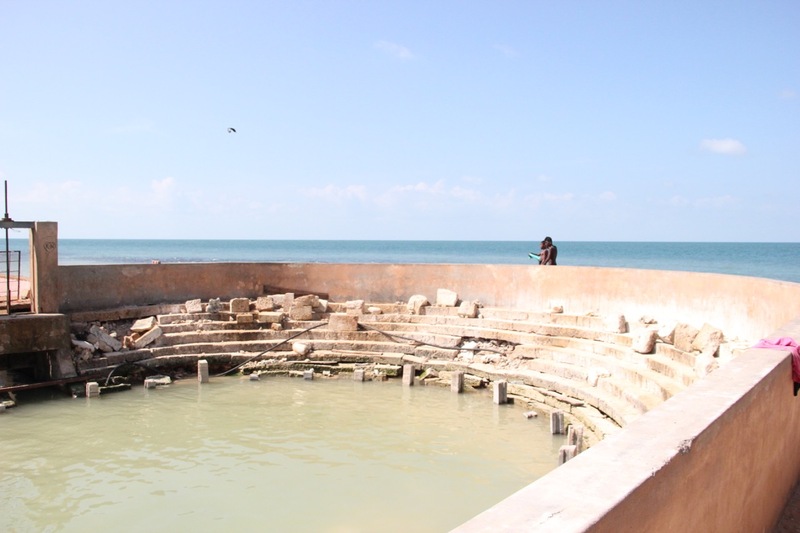 Keerimalai spring became famous during the 7th century visit of a Chola princess whose disease was cured when she bathed in this water and prayed to lord Murugan. But at this time the pond or spring is under renovation. The beach is amazingly pristine here. I also visit the Naguleshwaram Shiva temple next to the spring. I enquire with the main priest there about its back ground and he tells me that it is one of the Panchalingas in Sri Lanka (One of the five main Shiva temples in the country). Somehow he learns that I am an Indian. He tells me that our prime minister Modi was here about six months ago to inaugurate the Jaffna library. He tells me that on his way back to the airport PM Modi stopped at the temple. For some reason, that makes me feel happy. I later learn from my lonely planet book that this temple was bombed by the army in 1990 and most of the structures were destroyed. Everything is under reconstruction now. I decide to take this coastal route to Pedro Point but we end up circling around in army area. We find ourselves in a very scary area with ruined buildings, fences on either sides of the road and no people around. At times we see army officials guarding one side of the fence. After riding a few kilometres on this unpaved road we decide to head back to the main road. But the remains of the war is so predominant here. Some villagers seem to be returning back to start their life behind the fences. 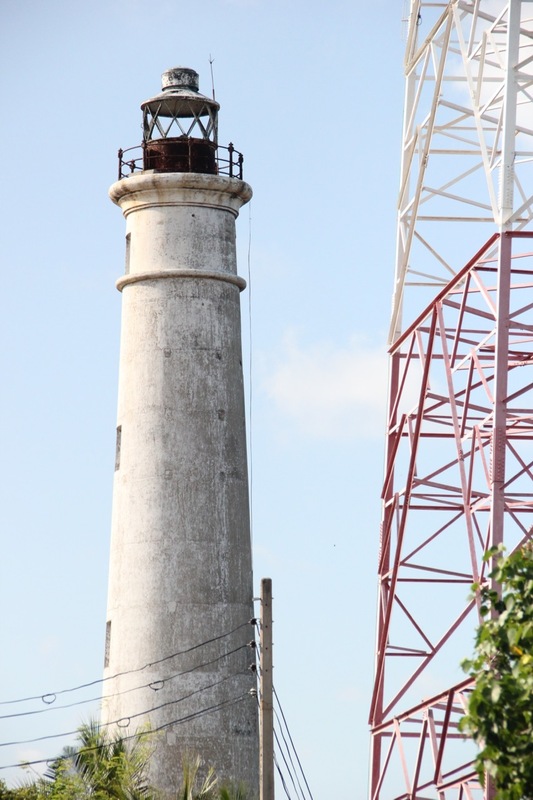 A long road leads us to Pedro Point, the northern end of the island country. I realise that India is only 40kms away from here. But as such there is nothing much around here other than a lighthouse in ruins and deserted beaches. People are mostly to themselves and they do not react to the tourists like in other parts of the country. I feel the wound of war very significantly in these parts of the country. For the first time, I see a lot of trash on the beach. Tadashi jokes that it comes from india and I noticing them to be fresh deny it and add to the joke by claiming that it comes from developed nations that dump their trash in poor countries. Back at the hotel, I chat a little with the old lady caretaker. Upon me complaining about the mosquitos she brings me some mosquito coils. With innocence and curiosity she asks me - Are there mosquitos in India too? That makes me smile while saying "yes , Sure." Upon learning my plans to visit Mannar the next day she tells me that her sister lives there and she often makes that trip. There are buses every half an hour starting at 5:30 AM. The Manager had misguided me by telling that there is only one bus to Mannar and it would be better to take a train to some point and then change to a bus. Per my earlier plan, I was to be in Jaffna during a weekend and thus had requested for hosts through Couchsurfing. One of the locals had agreed to host me. But since my plans got changed and I arrived on a weekday, I did not want to disturb him. But I sure wanted to meet J if he could stop by for a while. I leave him a note and he plans come visit me. When J arrives, he and I discuss our travels and experiences with Couchsurfing. He tells me that I should have contacted him and could have stayed at his place. He keeps mentioning that there are not much amenities in his house and I keep telling him that that would not have been an issue anyways as comfort is not a priority in such arrangements with locals. He also says that he could have given us his bike or asked a friend to lend their scooter instead of we paying for it. It is very nice of him but for me it is better this way than troubling others. He is a very well mannered and kind Sri Lankan I have met here. Tadashi, he and I decide to dine together at Cosy again. Over dinner, we discuss the civil war that recently ended. J tells me that he has suffered a lot. There was always curfews. A three year degree took him more than 5 years to complete due to the prolonged war. 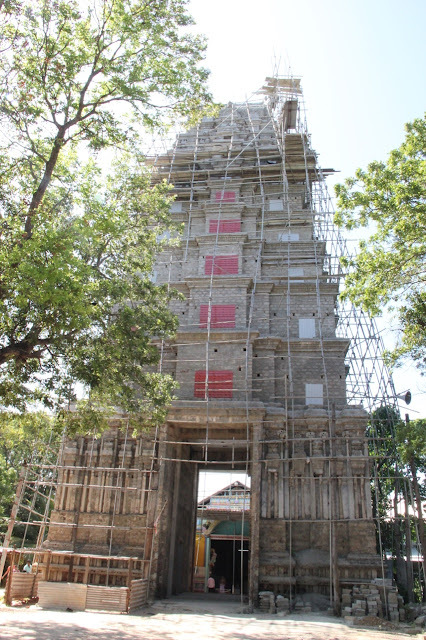 He does not acknowledge this makeover renovation and reconstruction by sri Lankan government in the name of development after the wound has been already made. Thousands of Sri Lankan Tamils still live outside of the country he says. He also thinks that LTTE had governed the area very well. The education under their rule was never compromised. Additionally, he acknowledges the moral support they get from India. PM modi has handed over 27,000 houses to the war affected Tamilians in Sri Lanka. "That moral support means a lot to us", he says. Even though it is a distant past, he says that he feels sorry for the mistake LTTE did by assassinating one of our ex prime ministers Further, he indicates that the younger generation do not care about politics. But when I ask him who else would represent them in the country, he says, there are similar MP and MLA’s but the younger generation prefer to stay out of the politics. He does not think that even after the war the Sinhalese have changed thus hinting towards a continued discrimination in one manner or the other by the majority. He tells that in the north, people are more connected to Indian politics than Sri Lankan. Moreover, we discuss the seed sown by the British while leaving Sri Lanka. Per their policy of Divide and rule they favoured the Tamils by providing them education and giving them higher posts in their councils. 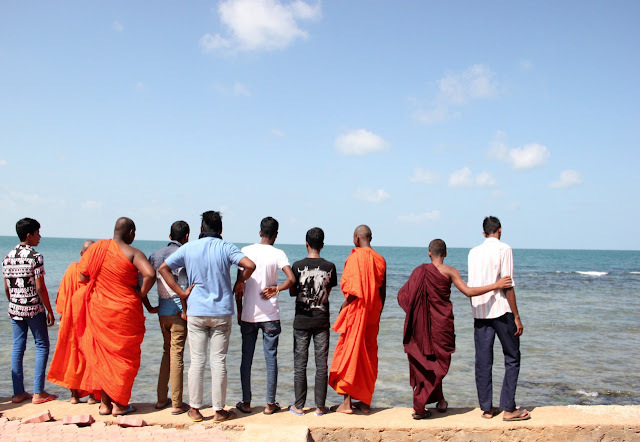 This somewhere resulted in growth of insecurity amongst the Sinhalese and then followed their brutal steps of discrimination through the "Sinhalese only" act of 1959. 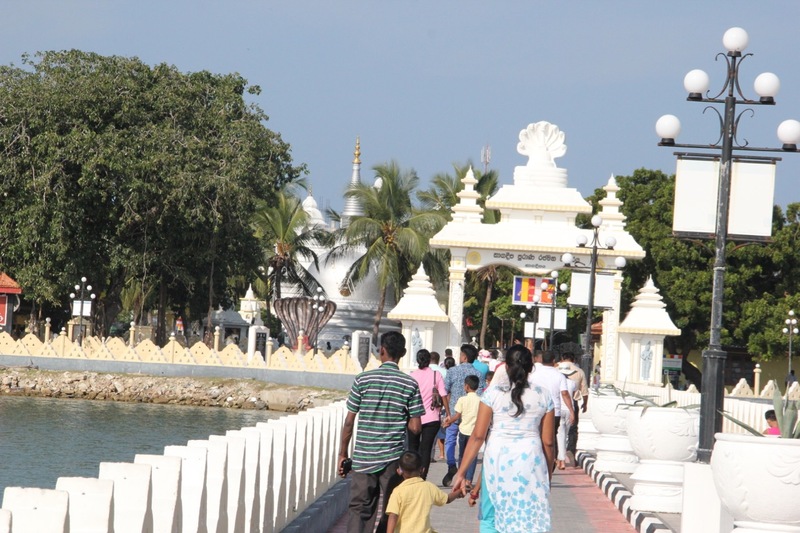 Several Tamils had to vacate the country. The worst effected being the Plantation Tamils, who where brought to the country by the British to work on tea plantations and now were denied citizenship in this country. As far as the British go, what they did to India was no different. The Muslims and Hindus were turned against one another during the time of independence. "But you got your separate countries", notes J. "Yes, but that was right from the beginning." I add. Tadashi thinks wars are always because of a dispute over territories and never because of religion. He thinks no religion asks people to kill. I disagree. In a surface level any war may seem like a territorial dispute but imagine if the people living in this country were all of same religion, same ethnicity, spoke the same language would they have fought similarly? So the differences is not about the land we own but the ethnicity we belong to. And having read some holy books myself, I know that certain religion even today calls for war and killing to promote their religion and some other call for forced conversion. So assuming that the religious preachings are always the most moral is foolishness. We discuss how all this could be bridged for a better future. Time is the only healer, we conclude. This conversation has moved me a lot in many ways. In J, I see a mix of frustration and sadness. Yet he is so compassionate and modest in acknowledging the moral support his country is receiving from the neighbouring country. He did not have to speak apologetically to me for LTTE’s mistake of killing our ex-prime minister after it has been more than 20 years but he chooses to. I am touched by his sensibility. However, it also worries me that they seem connected to India more rather than their own country. This is dangerous for the integrity of a nation. But who is responsible for this thought to originate in the people? What is the impact of addressing a problem in a wrong way? By solving issues in a wrong way are we not sowing seeds to several more issues? The ex president of Sri Lanka is facing several cases of war crimes but in places where damage has already been made, several bad seeds have already been sown. We always hope that time would heal but not until we stop living in the past and that holds good to both the parties in a conflict.